“Mrs. 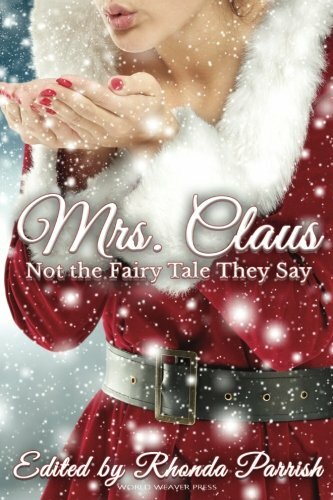 Claus: Not the Fairy Tale They Say” edited by Rhonda Parrish is an anthology of fantasy based holiday short stories in which the spotlight shines on Mrs. Claus. True to its subtitle, this collection is anything but the traditional version of a syrupy sweet Mrs. Claus fattening up a red-cheeked Santa before his big night. While I wasn’t necessarily expecting a bunch of feel-good, traditional, festive holiday tales, the enchanting cover does suggest, at least to me, romantic, magical-styled Christmas stories. Instead, readers will find fourteen different visions of Mrs. Claus that are diverse, independent, strong, creative and often quite scary! I enjoyed most of the stories in this anthology. They are all original, well-written and imaginative, but my favorite has to be “The True Story of Christina and Kristopher Kringle” by Ross Van Dusen. It is probably one of the tamest stories in the collection, relating the backstory of the childhood sweethearts and how Tina was the real brain power behind Christmas. “Miss ‘Lil Toe Head” by Michael Leonberger is dark and bizarre, and includes a bit of homesickness and nostalgia. I loved the characters – Miss ‘Lil Toe Head, who works as a Mrs.-Claus-for-hire during the holidays, and Mariana Claus, who, in this story, is a feisty cigar smoking Mrs. Claus. So good! “The Asylum Musicale” by C.B. Calsing was eerie and cruel, yet I could not put it down. In “Good Morning” by Kristen Lee, Eve (Mrs. Claus) risks everything to see one more sunrise. “Mrs. Claus: Not the Fairy Tale They Say,” edited by Rhonda Parrish is not for everyone. I would recommend it for fans of sci-fi and fantasy short stories featuring strong female leads. Those folks inclined to more traditional holiday short stories about a kind, loveable Mrs. Claus might not find this anthology so endearing. Still, I say give it a try – you never know, you just might find a new favorite genre.